Yes, I know they don’t use Red Flags for replay reviews in baseball, but they’re just so much fun for Rog to draw. Okay, some real talk: If the Giants don’t want to lose games, they shouldn’t let the other team jump on the scoreboard early, and they should cash in on when some of their players hit doubles. I don’t know, let’s just say at a rate higher than zero. But it’s embarrassing to the sport on how Tuesday’s game ended. Worse than embarrassing. But this is a sport that has spent five years trying to find a resolution to a stadium situation that boils over with raw sewage, and whose supreme leader recently said in an interview on CSN Bay Area that “I don’t want to comment on it…I don’t think it’d be productive.” You know, other than him being the one guy that two franchises have been waiting to say something on it. It’s also embarrassing to the Chicago Cubs, who frankly should be better than this. Hell, the team lost thousands of dollars in Spring Training due to a tarp issue when a game against the Giants at their new stadium was “rained out”, even though by gametime there hadn’t been rain for an hour. 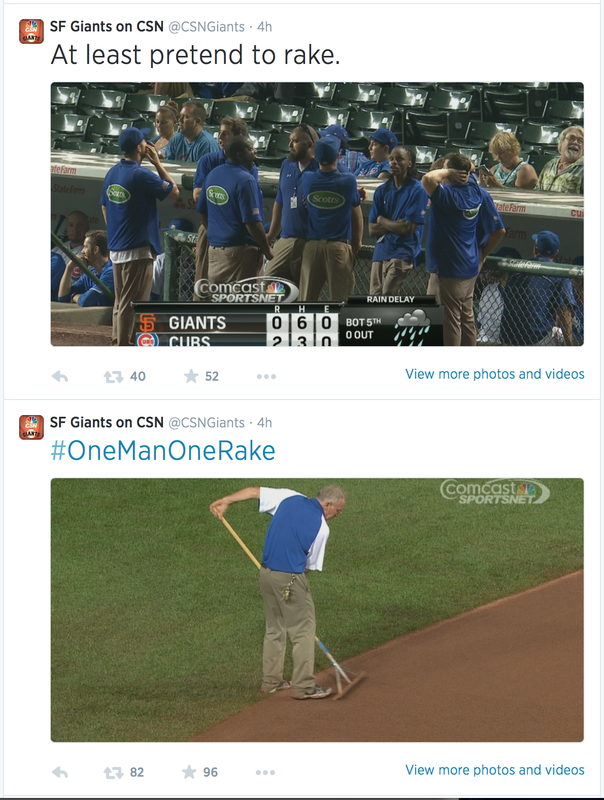 And neither of those were even the first times the Cubs had been unable to handle a little weather with the Giants. They wasted a game in 1999, calling for a rain delay more than an hour and a half before any rain fell. That caused Peter Magowan to call the Cubs a “Bush League Operation”, and frankly, stronger words were used last night. What is truly the most insulting part, however, is that the Cubs said over and over that they were doing everything possible to get the game in, during the 4 hour wait for a ruling. I’ll tell you what, I don’t feel very motivated to by anything from that Scotts place on the backs of those groundskeepers. Pathetic. Insulting. The Giants are right to protest, even though it’ll go nowhere. The Giants need to stop falling behind and even having a chance to lose in such ways. But this game, this game with playoff implications, should’ve gone at least 9 inning and given the Giants a chance.